Welcome to Appletree Cottage! A cosy, modern, well appointed spacious cottage in a peaceful setting with stunning views. Sleeping eight people in four comfortable fully en-suite bedrooms Appletree provides the finest in self catering accommodation. A large open plan living space contains a double height lounge, a dining area with ample seating for eight people, a breakfast bar and fully equipped kitchen. Almost the entire south wall of the living space is glass providing stunning views across open countryside to the distant Kilpatrick Hills. Biomass underfloor biomass heating warms the main space and all the bathrooms. A secluded patio provides a space for alfresco dining. So come, relax and enjoy! Appletree Cottage sits in peaceful beautiful countryside on a small fruit farm within the southern end of Loch Lomond and the Trossachs National Park. Built in August 2016 the cottage is modern, energy efficient and well appointed. Appletree was specifically designed for self catering groups and the resulting lay-out and amenity is with that in mind. With under-floor heating and hot water powered by biomass the building is well insulated, warm and cosy with an EPC rating Band B. A wood burning stove brings further cheer in the winter months. The living space open plan with lounge, dining, breakfast bar and fully equipped kitchen areas The cottage is ideal for family get-togethers as everyone is together in the one room but with ample space for eight people. The south side of the living area is glazed providing stunning open aspect views across open countryside and Cameron Muir looking towards the famous Whangy rock formation which can be glimpsed on a distant ridge. A south facing private patio soaks up the sun on the bright days and provides a very special space for outside dining. The patio is connected to the living space by a huge sliding glass door. Appletree is accessed from a single track quiet back road and has its own private garden laid to lawn and ample parking for four cars. With advance notice space can be made available for guests to store canoes, bicycles etc. In the lounge area a 50inch TV with and Netflix is provided as well as a Music Centre which can be blue tooth linked to a moble, ipad etc. and a DVD / Blue Ray player. Wi-fi is provided free of charge and the code for this is given on guests arrival. In the downstairs bedroom there is a TV with DVD player should the kids or others wish to go off and watch their own movie for a bit. The cottage has a selection of games, books and lots of information about places to eat and things to do in the area. Appletree Cottage is accredited FOUR STARS by the Scottish Tourist Board – Visit Scotland. Shandon Farm on which the cottage is situated, appears on maps dating back to The barn with the red roof adjacent to the road is one of the oldest and dates back to this time if not before. The farmhouse was originally single storey but in 1910 acquired its second floor. The farm was at one time mixed but in more recent times was a dairy farm of some 140 acres. In 2009 much of the pasture was sold off to a local land owner and the farmhouse, steadings and around 4.5 acres of land were bought by a couple intending to develop the site into a large house and garden. However, the property lay empty for over three years and by the time Murray and Alli, the present owners, acquired the farm in 2013 it was semi derelict. Since then the buildings have been restored – an activity still ongoing! In early 2014 the first apple trees were planted – there are now over 200 and in 2017 the first small crop appeared. This was pressed into apple juice, bottled and sold locally. It is hoped the harvest will increase as the young trees mature. There are no animals on the farm at present but wild deer, pheasants and other wild life are easily spotted. The cottage is private from the rest of the farm and the ancient stone barns provide good separation from farmhouse where we, the owners live. After we’ve welcomed and given a brief introductory tour of the cottage facilities guests are usually unlikely to see us again before the end of their stay – except to provide additional firewood etc. However we can always be contacted by text. If you have any further queries about Appletree Cottage please visit our website at www.lomondappletree.co.uk or contact us directly. Not suitable for dogs or pets or a party. The maximum occupancy is 8 people plus one infant. We are unable to accept bookings from Stag parties, Hen Parties or bookings where all guests are under 26 years old. A large south facing open plan living area incorporates a kitchen, dining area and double height sitting room and biomass powered underfloor heating throughout. Relax in the spacious living room and look out over the gently rolling fields, across the catterburn towards the rugged Cameron Muir and Campsie hills. 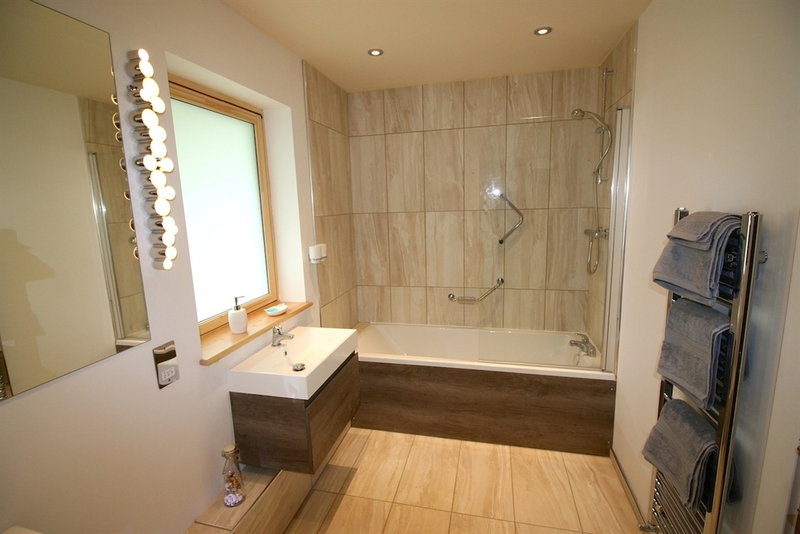 Underfloor bathroom heating and heated towel rail. Private garden mostly laid to lawn . Additional picnic style tables placed to catch the setting sun. Nearest pub – in Drymen village – 5 minutes The Wayfarers in Croftamie Village serves food and has a beer garden. Golf – Strathendrick (9 holes) and Buchanan Castle (18 holes) both within a two mile radius. SPA days (swimming pool, sauna, jaccuzzi and fitness suite) are available nearby.